Brenda Doneth has been involved with horses her entire life and has made it her personal goal to seek out the highest level of instruction available. This search has led her to training and riding with some of the best horsemen and women in the world. 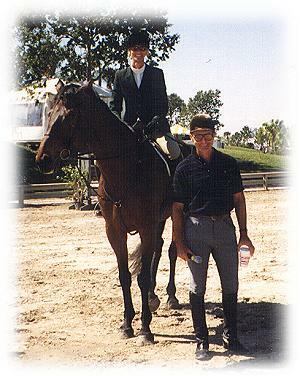 Brenda was owner and head instructor at Lakeshore Equestrians in Holland, Michigan for 12 years before relocating to southern Florida in 1997 to open Palm City Equestrians. During her forty plus years of owning and training hundreds of horses and riders Brenda has acquired countless championships and awards and held many positions on boards and committees and judged shows. Brenda also was host on the Equus HDTV show and Equus Stables TV show. Brenda has had the opportunity to train with and/or clinic with George Morris, Chris Kappler, Neal Shapiro, Hilda Gurney, Brett Moon, John Lyons, Jimmy Wofford, Marina Genn, just to name a few. Every Wellington show season we attend more clinics and training sessions with the greats of the world to share in their techniques and successes. Click here to learn about Robin Doneth. Memories from Lakeshore Equestrians in Holland, Michigan.